Last week I reviewed Tokyo Tattoo Girls, and it was one of the most distinctive, original, and interesting strategy games that I’ve ever played. The developer, Sushi Typhoon, also partnered with Aksys to release a horror game in the west just in time for Halloween on the 3DS. Called Creeping Terror, I initially ignored it, assuming that it would be something quite generic in application. That was before I'd played Tokyo Tattoo Girls. Then, on the strength of the Sushi Typhoon brand, I decided to purchase and play this one too, just to see exactly what this new developer's about. Related reading: A game theory on Clock Tower 3, a stalker horror game that shares some tonal similarities to Creeping Tower, looking at some of the game's deeper themes. 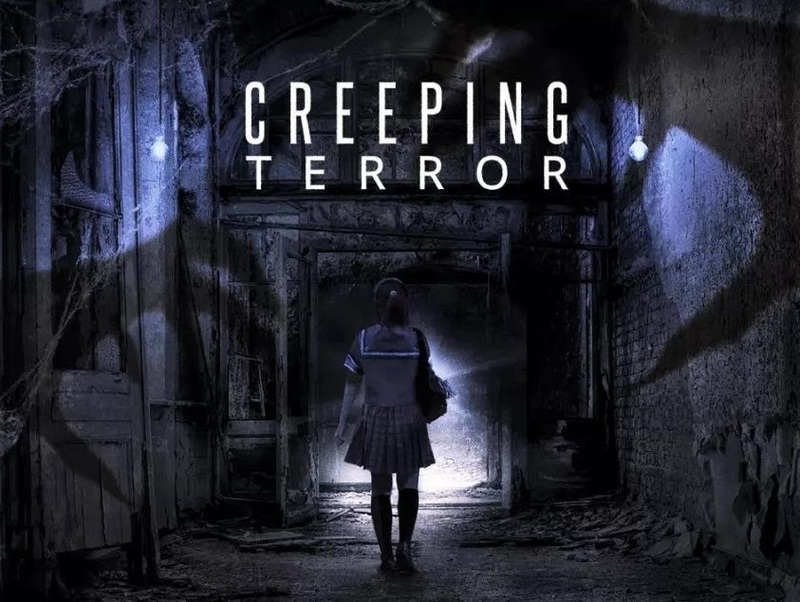 It’s probably a little late to actually review it now, but I felt absolutely compelled to write about it, because Creeping Terror is my favourite horror game this year (and it has been a good year for the genre), and is right up there with my favourite ever. There’s a Nintendo Switch HD remaster coming, and hopefully it gets the game more attention because, as with Tokyo Tattoo Girls, I don’t think the other critics entirely appreciated what they were looking at when they played this one. The best way to describe Creeping Terror is to say that it is Clock Tower 3 or Haunting Ground, played out in two dimensions. You play as Arisa, a girl who, along with three of her friends, decide to investigate the rumours that a particular house is haunted. They think it will be a laugh, but naturally it is, and before long Arisa finds herself stalked by couple of frighteningly imposing beings, both drawn directly from horror tropes of the ‘80s. One is a hulking beast that carries with him a shovel and has a strong Hills Have Eyes aesthetic. The other is a sleazy, hunched over creature that seems to have a perverse fascination with Arisa, tackling her to the ground in a rather lecherous way when she first encounters him. Luckily she's able to get away, but it sets the tone for that particular character, and when he's around he's creeping after Arisa in a way far more terrifying than the behemoth with a shovel could ever achieve. These creatures, much like the setting itself, is a delightful throwback to that bygone era of B-grade horror, and that matches nicely with the throwback nature of the gameplay. As anyone who has played Clock Tower 3 or Haunting Ground know, there was a particular breed of horror that was quite popular among Japanese developers back on the PlayStation 2: the stalker horror. In stalker horror games your character’s ability to fight back against the horrors in front of him or her is effectively non-existent. Where in Resident Evil the solution to a physical threat is to take a shotgun to the monster’s face, in these games, once a monster spots you, you need to have your character run like heck and hope to find a hiding spot – under a bed, in a cabinet, or something similar. And, once you find the hiding spot, hope that you got there early enough that the monster didn’t see you and drag your character out anyway. Because there was usually only one or two monsters around at a time (they would pop up at random, just to keep you on your toes), these games were more like adventure titles, with those heart-pounding chase moments for good measure. Creeping Terror nails this atmosphere to a T. It’s not the most difficult game – stalker horror games rarely are, but the atmosphere of wandering around a lonely, dark mansion, knowing that if something shows up it won’t be a relief, is thick. You're forced to really focus on the environments (keeping an eye out for hiding spots, just in case a monster shows up), and explore them thoroughly. That, in turn, helps make the environment memorable and vivid, and Creeping Terror's decrepit mansion is a great example of a fascinating horror environment. There’s a good story to the game, too. It’s fair to say it’s minimalist, but it’s also gently subversive and it deconstructs the B-horror genre without ever ruining the atmosphere. Most of the tropes of the genre that Creeping Terror indulges in, it also tends to draw reference to in an amusing manner. For example Arisa’s wearing a school uniform – playing right up to that particular trope. The game draws deliberate attention to that, and pokes fun at itself for it; Arisa’s wearing the uniform as she was meant to play the “on-camera” role when the group were exploring the mansion with the intention on filming their experience (before they realised actual monsters are in it), and the group were “cynically using it to get some extra viewers”. 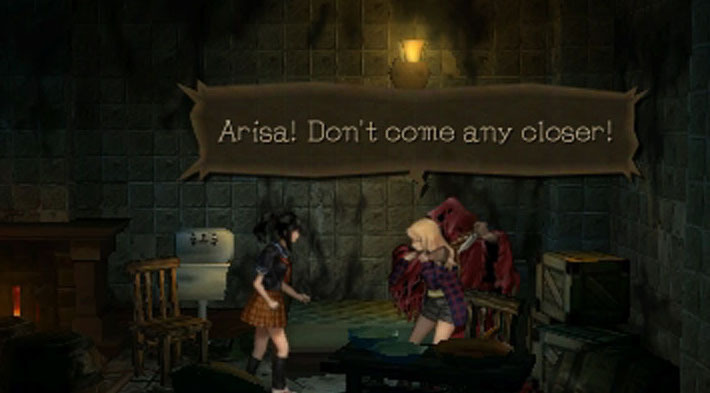 It’s not a stretch of imagination to assume that the developers were aware of Clock Tower 3 and its school uniformed Alyssa, giving the similarities in gameplay and names of the characters, so this character design works both as a homage to that classic title, and in making direct note of itself, shows the game has an awareness of how tropey it is. The game is filled with little nods like this - they're often very subtle, but this is a very self aware game. Arisa isn’t sexualised in any way despite that uniform, though there’s the odd borderline moment, usually involving the creeper monster I described above. She is portrayed as strong, intelligent and resourceful – certainly more useful than her three useless friends – and really I just loved following her journey. The broader narrative has a couple of surprises in it, generally told through clippings you’ll pick up along the way, but it really does pale compared to Arisa’s story. For a girl that doesn’t even have a face on the tiny, low resolution 3DS screen, it’s amazing how well the developers have been able to build her character and make us really care about her and her situation. Related reading: Another stalker horror game released this year that's very worthwhile is White Day. Matt's full review. Certainly Creeping Terror is a limited game; it’s short, it’s not overly challenging, and in terms of the game’s puzzles and mechanics it’s minimalist to a fault. Without those monster chases the game would be a “2D walking simulator” in its entirety. But I have loved every second of it. Its minimalist plot is written cleverly, it has a superb protagonist, the atmosphere is thick and, most importantly, the game straddles that line between being a homage to the games (and B-grade horror films) of yesteryear without being a slave to their faults. Between this game and Tokyo Tattoo Girls, Sushi Typhoon has instantly become a new favourite developer of mine. And I REALLY can’t wait to get Arisa in HD on my Switch.